The Wolves of Cernunnos. 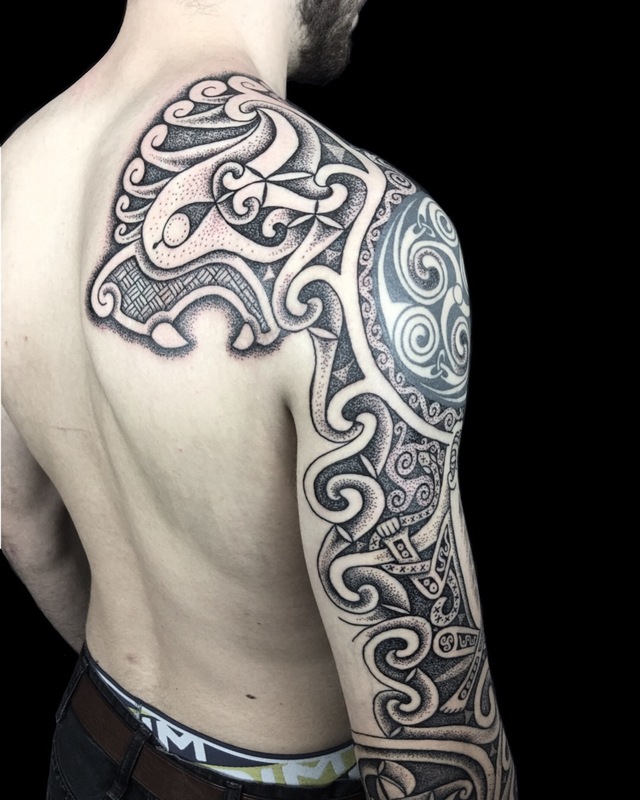 The linear celtic circle design was already present when I started this piece, so I set it as the theme for the rest of the tattoo. 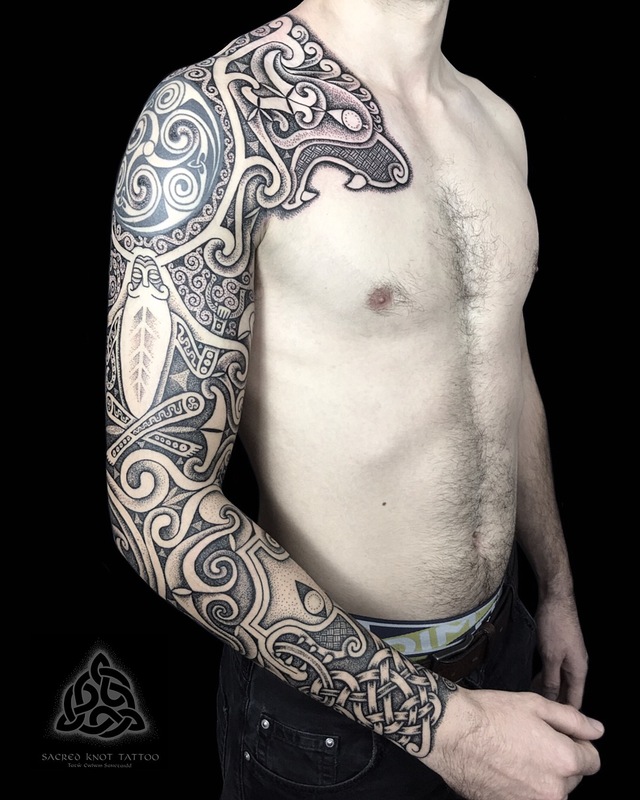 It’s based on the linear celtic style from Britain, Scotland and Ireland from 400-800AD. Before this art style, Britain was more Romanised from 100AD, and La Tène and pagan before that. After 800AD the high point of the art seems to have degraded in the Monasteries.. this was unquestionably due to the pressures coming from the Outside world. Wars, power struggles and viking raids. Recently an ornate Christian book in the high form of this art style was found in a bog in Ireland from this time of unrest.. maybe someone was hiding it and hoping it come back to it one day, or couldn’t bare it falling into unworthy hands. Or it was tossed away for fear of the power that lay inside its leafs. Either way it’s an example of how the art and the artists where dealt with. Through out all these times though where would have been pockets of the old pagan faith that survived in the face of the uncompromising White Christ, and the shaved tonsured wizards that preached his teaching from their godspell books. There where still people dragging bulls off to lake islands in Scotland to be sacrificed to unknown gods in seventeenth century. Cerninnos’s image has popped up in many corners of the old celtic world, and is heavily associated with animals and hunting. There is frustratingly few writings about him, other than his name and that he was revered. 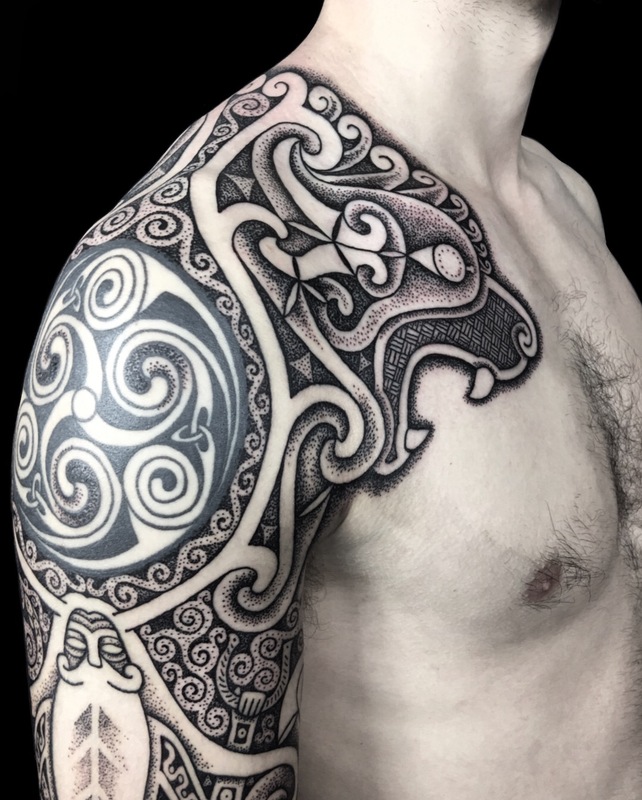 The wolf heads on the chest, back and wrist are an extension of the idea of the triskelion, and the power of three. This idea was deeply imbedded in celtic beliefs and was a major influence on the trinity in Christianity.